After this week, it’s hard to believe but the majority of fantasy football regular seasons will be over. While I could talk about the usual things about team management, I’m going to discuss a new feature I read about today. That is some leagues adding a feature where you can have a “late swap fee” throughout the year where you can replace a player after the fact. Maybe I’m wrong, but wouldn’t that take away most of the fun from fantasy football? It would completely eliminate any “if only I left player x on my bench” talks and would make a starting lineup pointless assuming you can put just anyone in. I’m hoping this is just an effort and isn’t something that fully catches on in the near future. QB: Marcus Mariota vs Colts: Don’t look now, but after a rough start, Mariota has put together two very nice fantasy performances in a row. Based on what we’ve seen of the Colts defense, there isn’t a reason to believe this wouldn’t continue. If you are looking for a quarterback to replace Cam Newton or a contrarian play in daily formats, Mariota could be your guy. Expect 270 total yards and two touchdowns. 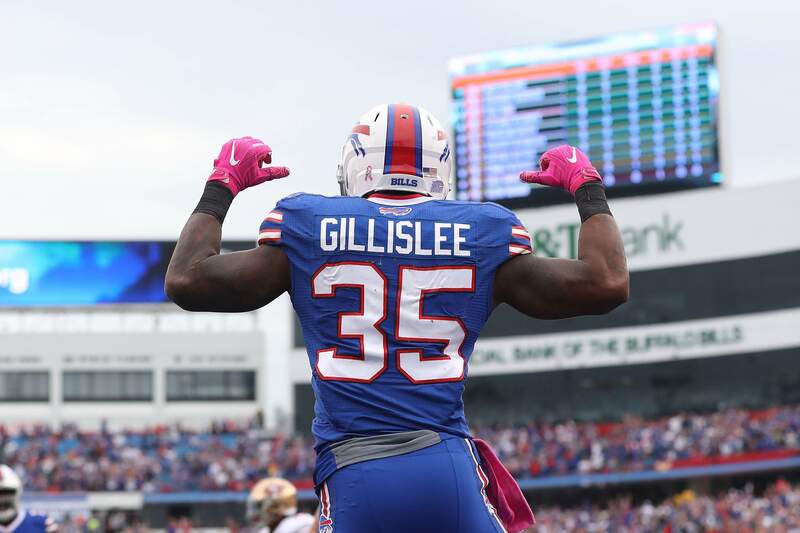 RB: Mike Gillislee vs Dolphins: One of my brother’s favorite things he has mentioned to me in fantasy sports is a concept known as “narrative street”. This is a phenomenon where a player takes on a former team, a former coach, playing in a home city, etc. In this case, we have a very good chance of Gillislee making a start in place of an injured LeSean McCoy for a run offense firing on all cylinders. Did I mention Gillislee was also drafted by the Dolphins? It’s worth noting that Rex Ryan can be a very petty individual, so if Gillislee does get the call (check all injury reports at around noon on Sunday), he is well worth the start. Expect around 90 total yards and a touchdown. WR: Tyrell Williams vs Falcons: The Chargers/Falcons game has the potential to be an absolute shootout, so having some exposure to it in daily leagues or your normal fantasy league isn’t a bad thing. Williams of the Chargers wideouts probably offers the highest upside, which makes him a very compelling option this week. Expect around 70 yards and a touchdown. TE: Vernon Davis vs Lions: The Lions have struggled with tight ends all season, and even though Jordan Reed loses out on a fantastic matchup, Davis now has a fantastic opportunity. While it has been a few years now since being a top fantasy option, Davis is worth a flier for those who have someone like Greg Olsen on a bye week. Expect around 50 yards and a touchdown. K: Mike Nugent vs Browns: What’s going to happen when a struggling defense faces an offense which has performed below expectations? I’m expecting plenty of field goals. Nugent already has a five field goal game to his credit this season, and while I’m not expecting that a double digit point performance is certainly in play. Expect around two extra points and three field goals. DEF: Ravens vs Jets: While they are still an above average group, the Ravens defense has sort of gotten by on reputation the past few years for fantasy purposes. This week despite being on the road, it seems hard to go against them with Geno Smith making his first start of the year. Considering that Eric Decker is out and Matt Forte’s production has dropped off from the early portion of the year, there is a lot to like here. Expect around three sacks, an interception and a fumble recovery. This entry was posted in fantasy football, NFL, sleepers and tagged 2016 week seven fantasy football predictions, 2016 week seven predictions, Baltimore Ravens, daily fantasy football advice, Fantasy football, fantasy football sleepers, Marcus Mariota, Mike Gillislee, Mike Nugent, NFL, Tyrell Williams, Vernon Davis. Bookmark the permalink.